If you haven’t heard the name Sergio Dipp today, you probably will. 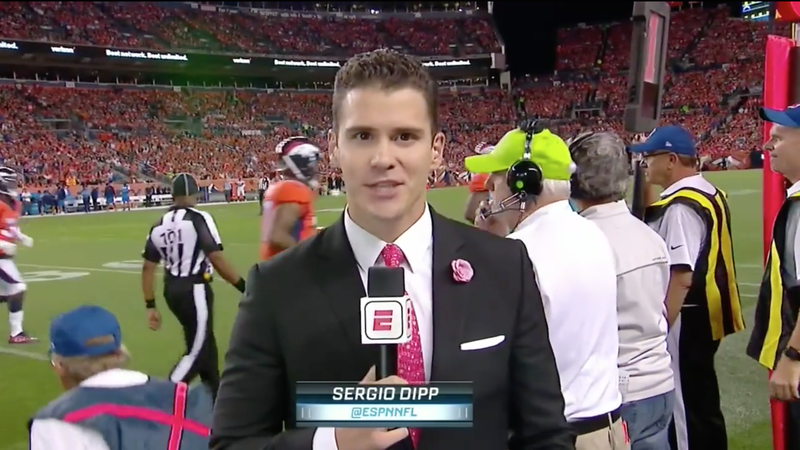 Mr. Dipp is a several year veteran of ESPN Deportes, and the brass at HQ in Bristol decided to give him his big break – by making him the sideline reporter for the second of two Monday Night Football games last week. Now you may not have seen this live, because the Monday Night Football doubleheader to start the year is almost as bad as having Thursday Night Football throughout the year. The nightcap of this double-dip is always some awful AFC or NFC West game that nobody east of the Rocky Mountains cares about. Case in point, its ignominious list of past play-by-play announcers. Mike and Mike did it a few times (stick to your day job, please). 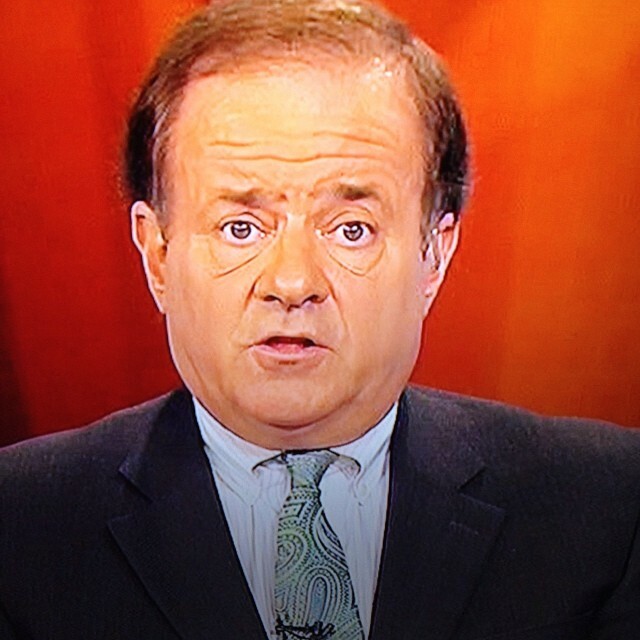 And Chris Berman swooped in occassionally. Side note: It always seemed to be Grand Poobah Berman’s M.O. to take the big events. You can argue it was his right, having been with ESPN since its inception in 1979. But despite his legendary 1980’s pre-cable pre-internet NFL Primetime status, he always struck me as Brett Favre, hanging on just a little too long. You gotta feel for the 29 year old. It’s his big moment, on national television, and he tanks it. I’m not making fun of him. In almost two decades in radio, I’ve messed up live on the air dozens – maybe hundreds of times. So you laugh at yourself and move on. But a producer, either on the broadcast, or back in Bristol, made the snap judgement call that this “live hit” was so bad, that they wouldn’t use Mr. Dipp the rest of the night. That’s it – one and done. This is the football equivalent of a rookie quarterback throwing his first NFL pass, and having an interception returned for a touchdown. If he never sees another snap, he’ll be psychologically destroyed. To put it another way, the first time I was in a fender bender as a teenager, my parents made me get behind the wheel the very next day. Shake it off. Unfortunately for our friend Sergio, he was never given an opportunity to recover from this car wreck. This cub reprter could have laughed at himself on social media, been self deprecating, and there would have been a groundswell of support to give him another chance. Heck, maybe someone would have set up a GoFundMe for him. He started with the self deprecating route, posting this at 11:11pm. But before he went to bed, he had to post a video rant, that was at best incongrous, and at worst, offensive. The video started with the same odd cadence as his unfortunate sideline hit. He also felt the need to explain date, time, location, and teams, because this self-important rant may have been saved for perpetuity. Well, viral and embarrassing is more like it. The point that Sergio was trying to make in his now-infamous cut-in was actually a good one. It’s 9/11, we are celebrating our great country and its diversity. You’ve got two black NFL head coaches making their league debut in that role, with a Mexican-American sideline reporter, and a female play-by-play announcer (most reviews have Beth as the most highly praised of that group). Here’s what’s not clear, and I’d like to see this explained by ESPN Brass. Now, this is a network that’s had to make cuts to some big name talent recently, and has dealt with a lot of bad press. Was Dipp removed from the game because, in the current political climate, they felt it was inappopriate to talk about race? Or was he, (as I believe), pulled because he choked in his big moment. If the former is true, that’s a bold move by ESPN. If its the latter, give the kid another chance. You know what else Americans love? A comeback story. For more on the story, and more Internet reaction, The Washington Post has a nice piece, as does Deadspin.